The new Tiara 44F Flybridge advances the reputation that the brand has achieved over the years. The late 19th century art critic, John Ruskin, famously said, “Quality is never an accident. It is always the result of intelligent effort.” This quote was very much on my mind as I toured the new Tiara F44 Flybridge on its debut at the 2016 Fort Lauderdale International Boat Show. As I took in the details, the flawless craftsmanship, the thoughtful placement of all the elements that constitute a superbly crafted yacht, my thoughts pivoted to 1955. That was the year Leon Slikkers founded the boat building company that would bear his family name, and that would eventually become S2 Yachts, builder of the highly-regarded Tiara and Pursuit brands. Quality was, and is, never an accident in those builds. The Tiara F44 is the second model in their Flybridge series of yachts which also includes the F53. Like the relationship between the flybridge and coupe models of its larger sister, the F44 Flybridge is based on the same hull as its closely related 44 Coupe. 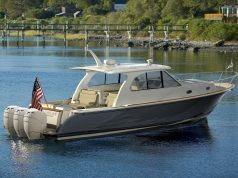 The 44 hull was designed in-house from the beginning to be used in both Coupe and Flybridge configurations. The Tiara Yachts design team’s forward planning produced a modified-V hull with 18 degrees of transom deadrise that is more than capable of supporting the extra weight of a flybridge structure—approximately 2,500 pounds dry—without adversely affecting performance. Both yachts are powered by twin 435-hp Volvo Penta IPS600 drives giving the 44 Coupe a top end speed of 30.9 knots compared to the 29.3 knots of the 44F at wide open throttle (WOT). Both models’ performance numbers are directly related to the inherent advantages—lower drag and cleaner water flow to the props—of the Volvo Penta IPS, a propulsion system that Tiara Yachts has been deeply involved with from the innovative pod drives’ introduction to U.S. boat builders. Joystick handling was also a significant attraction. Owners who prefer traditional straight drives will have twin 550-hp Cummins QSB 6.7 diesels as an option. It is worth noting that the optional Cummins Inboard Joystick system, which digitally controls the diesels and thrusters to make close-quarters handling more precise, is available for this propulsion choice. With a two-stateroom, two-head layout that is identical to both the 44 Coupe and the 44F, which is designed to serve well the prototypical family of four, or the older couple with friends, the yacht I toured had one undeniable advantage: the addition of a flybridge bumps the daytime capacity for on-the-water entertaining to eight persons with three distinct outdoor spaces plus the enclosed salon. My personal preference for flybridge designs includes that advantage, but it is also blended with my appreciation for longer sightlines and more distant horizons, as well as the ability to fully enjoy the open-air aspect of boating. I will readily admit that, as I grow older and wiser about comfort afloat and reduced exposure to ultraviolet radiation, a flybridge makes the best sense for me these days when there is a lower helm station to which I can retreat. 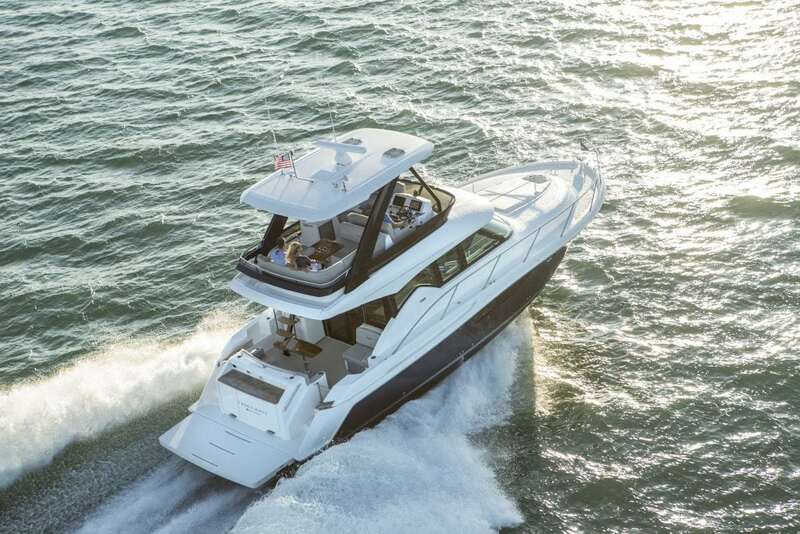 That might seem to give the 44 Coupe an edge, but Tiara’s designers have graced the Tiara 44F with the desirable option of a lower helm in the starboard forward portion of the salon. And while this will undoubtedly infringe on the starboard side love seat lounge found in the 44F, it adds versatility for the flybridge design, particularly among those who may move the boat long distances regularly—up and down the ICW annually, for instance, or around the Great Loop—where waiting for optimum weather may not always be possible. On the subject of desirable options, the list has some add-ons new owners will surely want. For those in warmer climes, there’s a dedicated 16,000 BTU air conditioning system, as well as a full flybridge poly-carbonate enclosure. Serious cruisers will opt for the Nautical Structures hydraulic lift swim platform, which features teak inlay, as well as an integrated chock system for the RIB. An optional electric outdoor grill with storage atop the transom can add meal prep convenience in a favorite anchorage, while teak decking for the aft deck adds style and comfort underfoot. 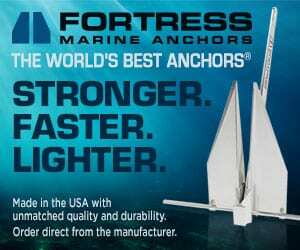 An all-chain windlass with helm remote control, a combo washer/dryer in the guest stateroom and Dirt Devil central vacuum system stand out from the list, as well. There is much to like about the overall exterior design, starting with a contemporary look that, in my estimation, will retain its appeal well into the future. Twin boarding stairs leading up from the 60-inch wide swim platform improve access in both directions for docking or water sports. Molded side steps and precisely placed hand holds make getting up to the side decks very safe, as do the handrails above the cabin windows and the stainless-steel safety rails that are high enough to be easily grabbed without bending over. Tiara’s renowned diamond pattern non-skid deck is one of the most effective I’ve ever encountered, running from the cockpit to the bow pulpit on decks that are easily walked. Teak treaded aluminum stairs lead up to the sleek flybridge, with plenty of stainless steel handrails for support and a hatch to keep the aft deck dry. 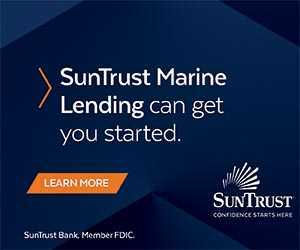 Notable features include a standard hardtop with two Bomar hatches, lounges fore and aft (the latter with a manual hi/lo table that converts to a large sunpad) and a built-in entertainment center with fridge, sink and cutting board. The helm is set to starboard and is well thought out with Volvo Penta’s Glass Cockpit integrated electronics package as standard equipment, in addition to an electrically adjustable double helm bench seat and a leather-wrapped steering wheel. Throttles and joystick are mounted to the right of the bench, and one of the multifunction device (MFD) screens is directly ahead of the steering wheel—perfect for at-a-glance navigation and boat performance information updates. Wide-opening sliding doors form the aft cabin bulkhead and blur the distinction between salon and cockpit seating. The galley is positioned to starboard immediately inside the sliding door, making meal service equally easy between the aft deck transom bench and manual hi/lo teak table and the four-person L-shaped lounge to port, which also has a manual hi/lo table of high-gloss teak. Corian graces the countertop in the galley, which is equipped with a stainless steel undermount sink and a recessed two-burner electric cooktop. Stacked under-counter Isotherm refrigerator and freezer drawers, along with loads of storage above and below the work surfaces, and a microwave/convection oven, complete a galley that should be at home for entertaining or mealtimes. Architectural-quality teak and wenge wood are found throughout the interior, complemented by solid teak floors in the salon, the lower atrium at the foot of the centerline companionway stairs, and in the master stateroom. Views from the salon are amazing through almost 360 degrees, with two sliding windows to promote natural ventilation on those days when the 22,000 BTU of dedicated air conditioning is not required. There’s a private entrance to the master stateroom in the bow and to its portside ensuite head compartment both of which are served by a dedicated 8,000 BTU air conditioning system. The large pedestal berth has good access from both sides, two opening ports and an overhead hatch for natural light and ventilation, and a pillow-top innerspring mattress for comfortable sleeping. A cedar-backed locker tops an abundance of shelf and other storage. The head features a separate shower compartment with a teak seat, an opening port, medicine cabinet, and a contemporary vanity with a vessel sink. The VIP stateroom also has a private entrance, twin berths, its own cedar-backed hanging locker, and easy access to the starboard side head compartment, which also serves as the day head. A hull-side window with an opening port provides natural light and ventilation. 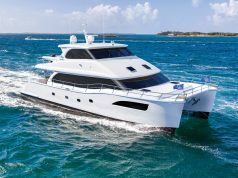 The Tiara 44F Flybridge continues the Tiara traditions of elegance and innovation as a yacht superbly designed for comfort afloat, with the kind of precision handling and performance that could make any owner’s operation a joyful time on the water.